One World Actors Prods.-Animal Rescues Charity hasn't added a story. all enduring extreme neglect, hunger and thirst. 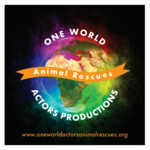 One World Actors Prods.-Animal Rescues Charity hasn't posted any updates yet.